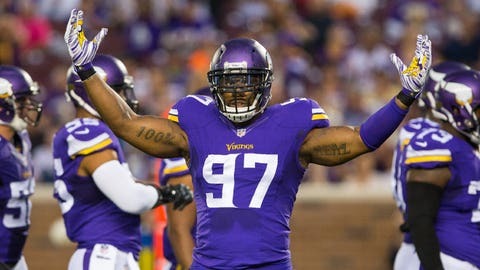 Vikings DE Everson Griffen leads the team with 4.5 sacks this season. The Minnesota Vikings are looking good. They have a scary defense under head coach Mike Zimmer, who has assembled a pass rush that ranks among the NFL’s top 10 with 17 sacks on the season. The Vikings have ridden that rush and a steady dose of Adrian Peterson to a 4-2 record so far this season. The leader of Minnesota’s pass rush, defensive end Everson Griffen, spoke about his team’s strong start on Monday. Griffen currently leads the Vikings with 4.5 sacks, even though he was a last-minute scratch for the Kansas City Chiefs game in Week 6. On the field, he is reckless. But his measured confidence in the quotes above reflect both his humility and desire to win. Rookie linebacker Eric Kendricks is taking nicely to the Vikings’ defense right behind Griffen. He is second on the team with 4.0 sacks in six career games — and only two games as Minnesota’s starting middle linebacker. The Vikings have several other stars balling out on defense this year, including safety Harrison Smith, linebacker Anthony Barr and tackle Linval Joseph. They still stalk the 6-0 Green Bay Packers for the lead in the NFC North, but Griffen’s group has been cautious of all the mousetraps along the way. They won’t be easily fooled by some Cheeseheads.